It's just your face. : Day 13...I knew this would happen. 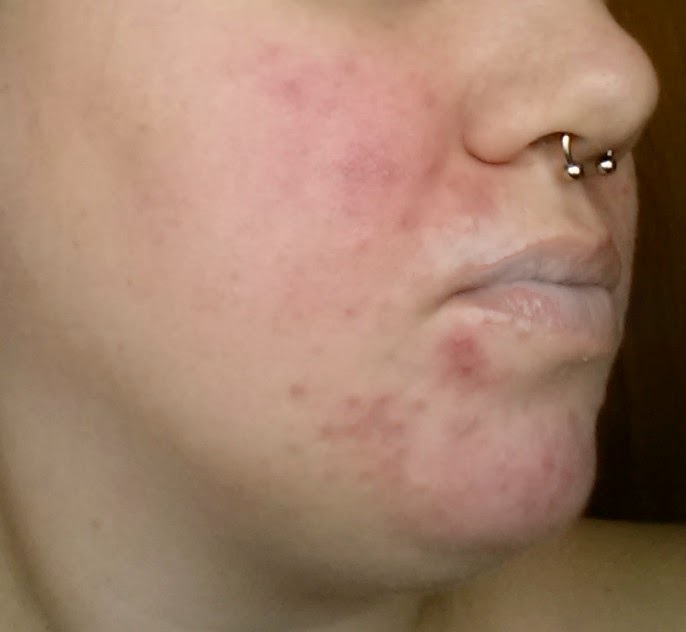 So I didn't come to the demodex conclusion or treatment out of the blue, I did a lot of read and a lot of research most of it here on a rosacea forum. While reading and researching I pretty much self diagnosed demodex mites as being my main culprit. I had all of the signs, the pustules, the redness, the itching, acne medicine not working a lot of different things. So when I figured out that was my problem next was to see what treatment options I had and see how they worked for different people. Some people had used borax, some had used sulfur, some had used a cream you order from over seas called ZZ cream or Zhongzhou Zinc Oxide and last some had used tea tree oil. While trying to chose which treatment to follow I read a couple of threads that people wrote chronicling their treatments and their ups and downs, (like I am doing here but without many pictures) to help decided which treatment I would follow. On one of the threads someone posted this from I believe the ZZ cream website called demodex solutions which tells you what you can expect week to week with treatment which I will put at the end of this post. Actually they have a lot of good info on their site so check it out here. So the reason I went with tea tree oil is simple really. First, I already had some, second I didn't have to order it from overseas and it kinda creeped me out that they won't tell you ALL the ingredients in the ZZ cream, they say ancient Chinese secret or some crap like that. (but the ZZ cream has good reviews!) I didn't want to do the borax because it just seemed so harsh, like using ajax on my face or something. And I did order the sulfur in the form of nu-stock. It is really hard to find a product that has a high enough sulfur content that it would actually be beneficial. My nu-stock comes today but I didn't want to wait that long to get it to start treatment so I went ahead with the tea tree oil and here we are today. I might bust out the nu-stock for the next two weeks....maybe. So with that being said, I KNEW that there would be setbacks, I knew I would break out again, I knew it was coming. That doesn't mean I have to like it! Yesterday my skin almost looked pretty! Almost. It was the best it had looked since I got back from California. And then I woke up today. Now don't get me wrong, it still looks way better, but it's a step back from yesterday. I am trying to think if I ate something, or was around something that might have triggered it but I can't think of anything. I really need to start keeping a food/face journal. But even so usually if I eat something my face doesn't agree with, it lets me know right away. Anyways, today I woke up and it really isn't bad, just not as good as yesterday so it made me blah. 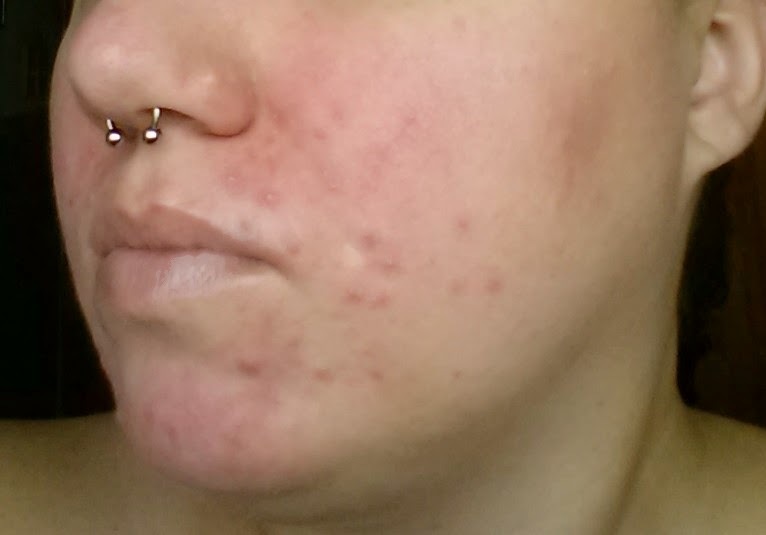 But my face was a little more red, and I had two BIG pustules and I have a big pimple under my lip on the right and another on the left half way between my lip and chin that are just being persistent for some reason. (that is one of the ways I can tell the difference in pustule and pimple, pimple is deeper under the skin and stays around a lot longer). I am not calling it a set back, but my face would react like this on a day where I have to go meet a bunch of new people. BTW I just had sushi and I don't think my face likes soy sauce, I can feel the flush coming! At least I don't eat it often. Okay so here is the week by week that I saw posted for the ZZ cream that I am guessing will apply to my face also and after that I will post today's pictures. Itching begins to subside and your skin becomes calmer. In addition, preexisting pimples and bumps begin to shrink and dry. Week 2-3:During this period, you’ll experience the most severe breakout of the entire treatment. Your skin will become more dry and clusters of bumps similar to a mosquito bite might surface in affected areas. Don’t become alarmed or disgruntled during this difficult time. If you experience a breakout, it’s due to the dead demodex mites under your skin. As their bodies decay, the demodex produces bacteria inside the follicles of your skin. Once the bacteria is gone, the bumps will disappear and healthy skin will be revealed. 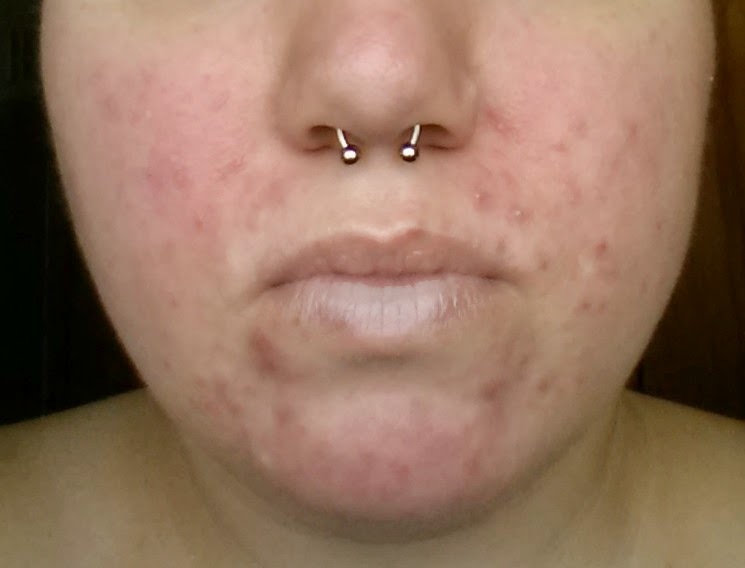 Week 4:Noticeable improvements to your skin will become apparent. Week 5-7:You’ll experience a series of light rashes and breakouts during this period. It won’t be nearly as bad as the initial “die-off” stage during weeks 2 and 3, but it might seem like a setback (it’s not). These breakouts are caused by the decaying demodex mites that recently hatched from the eggs of the demodex parents killed weeks prior. After this group of offspring are eliminated, you’ll begin enjoying clear and healthy skin. Week 8:A treatment of 90 days is recommended for total elimination of the demodex mites, but after 60 days, you’ll begin reaping the rewards of your treatment. You’ll start receiving compliments from family and friends on account of your bright and healthy new skin. This is when you know you’re rounding the final stretch. Week 9-12:Even though your skin looks and feels completely cured, continue the treatment for 12 weeks. Week 13 & Beyond:Although a 90 day course is recommended, it’s important to complete maintenance by applying the demodex treatment 2 times per month. This ensures no new overgrowth of demodex mites and it keeps your skin in optimal condition so you can continue enjoying bright and healthy skin.